Dragon1 distinguishes between the term architecture and structure. A structure is a system with a constructional, functional and decorational dimension. A structure can be viewed at conceptual, logical, physical and implementation level. A logical enterprise structure blueprint would focus on the logical aspects. An enterprise structure blueprint may address aspects from the four levels of abstraction. An architecture is a total concept, so an architecture blueprint would focus on the conceptual level of an enterprise structure with concepts and principles. This picture shows an example enterprise structure blueprint. An overview like this is necessary in any organization. You will create this blueprint by using one web application on Dragon1: The Visual Designer. 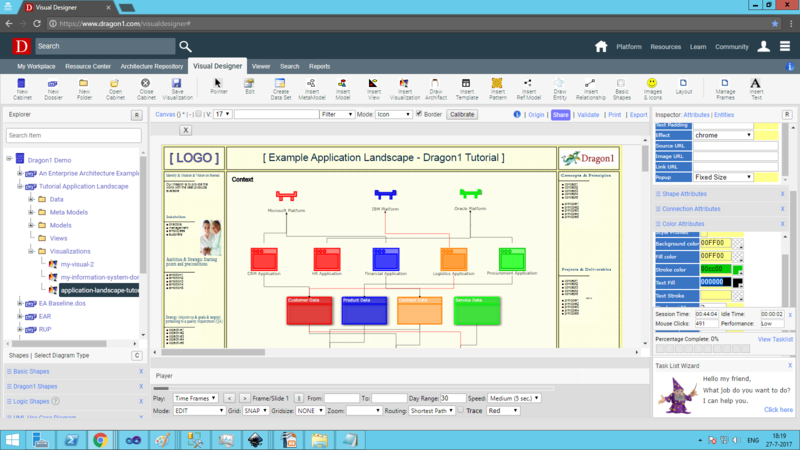 Dragon1 is a SaaS platform for co-creating and managing enterprise architecture. 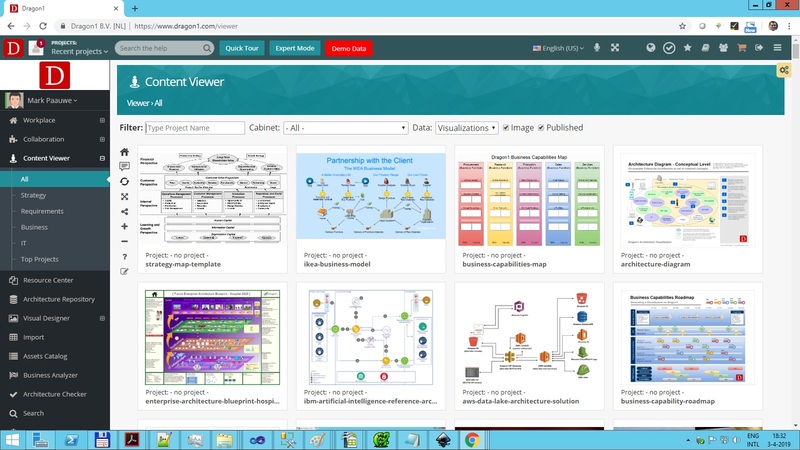 It is a suite of web applications that can be used for creating interactive content and products like: Enterprise Architecture, Business Models, Processes, Landscapes, Blueprints and Roadmaps. In this tutorial you will be using four web applications: Architecture Repository, Visual Designer, Content Viewer and Resource Center. 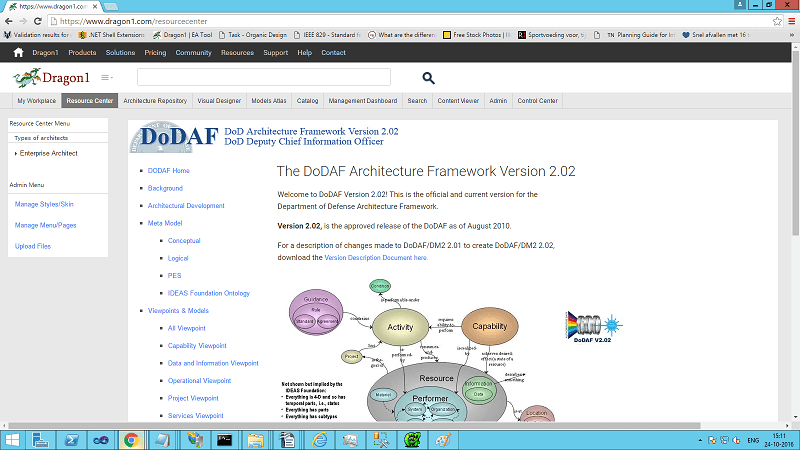 You can access each of these web applications by clicking on the corresponding label on the buttonbar above. Create folder structures and enter data manually, enrich data or import data from files. Choose from 400+ entity classes. Create meta models, models, views and visualizations. Use templates and shape libraries. Create and reuse patterns. Watch content create by you or other. Comment the visualizations, search, compare, trace and filter visualizations. Create your own resource center or intranet. 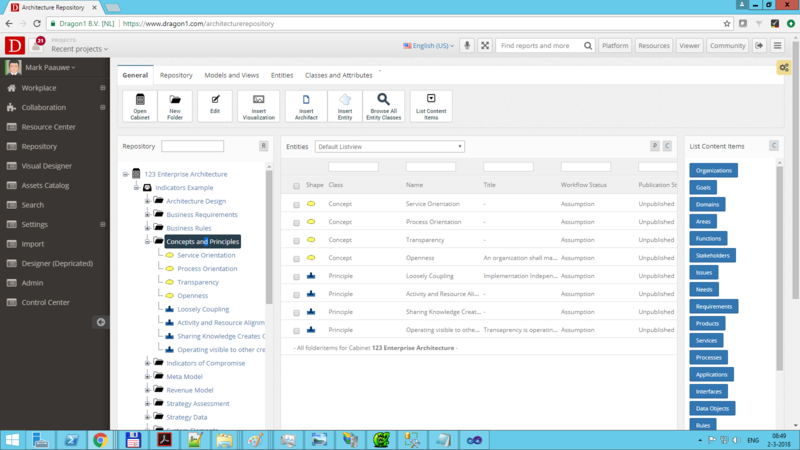 Publish your input documents, strategy, architecture and transformation. First we are going to create a dossier structure in a cabinet to store our data in. On Dragon1 you can enter data by dragging shapes to a folder. Draw connections between the shapes using the smart tools of a selected shape. Functions view, Process view and Activities view, etc.. Drag a shape on the canvas. You will use this shape to generate the view data with on the canvas. One for Functions, Processes and Activities. Enter the following view rules in the data attributes panel of the inspector. With this rule you will only see the processes from the view data. You can also show the whole view with Rule Condition = *.